The world is increasingly embracing digital technology, and so too are our schools. But many girls are still missing out on developing IT and programming skills, writes University of Melbourne department of computing and information systems associate professor, Karin Verspoor, in this article which first appeared in The Conversation. IT classes in schools mostly focus on basic skills, such as how to use email or spreadsheets, or use tablets to access online quizzes and educational games. Programming and algorithm-based problem solving don’t form a part of the typical school day. They tend to get taught only in extracurricular classes, such as coding clubs. But these tend to attract kids who’ve already expressed an interest in technology and want to learn more. The students who don’t know what coding is, or who don’t identify with computer culture (often in the form of computer gaming), are less inclined to participate in these extracurricular clubs. This kind of opt-in training means many girls are missing out, particularly if they perceive IT to be a pastime for boys. Gender stereotyping of toys may also push girls away from technical interests. Parents tend to buy gadgets for boys more than for girls, as suggested in the United States by a National Public Radio story on plunging numbers of women studying computer science. Or girls may not be as interested in computer games due to the lack of female protagonists, as argued eloquently by 15-year-old student – and coding teacher – Ankita Mitra. Or perhaps girls simply don’t feel welcome in these clubs. A recent report on female participation in computing from Australia’s Digital Careers group explores the lack of engagement by girls in computing. It concludes that the best strategy to increase the proportion of women participating in computing and IT is compulsory and sustained engagement with an integrated digital technologies curriculum, including gender inclusive activities. Digital technology skills are not going to be optional for our students for much longer. The United Kingdom has implemented a coding curriculum that will see children as young as five learning to program. Here in Victoria, a new digital technologies curriculum came into effect late last year, reflecting the national Australian Curriculum: Digital Technologies. From 2017, students will be taught computational thinking, and will learn to collect and interpret data using automated tools, and to transform data into information through digital solutions. These changes require teachers who are able to deliver the lessons, and appreciate the value of the skills. The Computer Science Education Research Group at the University of Adelaide is playing a vital role in preparing teachers for the new curriculum, by developing online courses that focus on teaching in the digital technologies learning area. Schools also have to find place for these activities in a curriculum that is already overcrowded, forcing them to consider what their priorities for educating children are. I hosted a fascinating panel discussion on Women in IT, for last month’s 60th anniversary celebration of computing in Australian universities. The panellists had more than a century of experience in IT between them, and explored the many factors that both drew them into IT, and helped them to stay. An informal poll suggested that many of the audience members – largely, very accomplished women in IT – shared this attitude. This suggests that the women who are successful in IT today are trailblazers. They are determined, and have been willing (and able) to push through barriers to pursue their passion. It suggests they have fought through the myriad anxieties that women in IT often express, and have survived. They have done this, it would seem, despite lack of encouragement and, in some cases, outright rejection. Does it have to be so hard? Do girls need to have that fire and determination to have a successful career in IT? I suggest that we have to mainstream IT, for both boys and girls. We need to make it just as normal as reading, writing and arithmetic. As normal as a career as a doctor (where women may soon outnumber men) or as an educator (where women already do). Something that everyone learns, and anyone who finds it interesting can pursue at more advanced levels or maybe choose for their career. This sentiment is echoed by a 17-year-old student from Methodist Ladies’ College in Melbourne, Belinda Shi, who will be representing Australia in the International Olympiad in Informatics (IOI) in August. She doesn’t want to be seen as “that female on the informatics team” but rather to be recognised for her programming abilities. Being singled out for your gender is not always comfortable. I hope for a time when we don’t have to talk about engaging girls in IT, because girls are naturally engaged in it through their learning. And for a time when we don’t have to highlight the accomplishments of women in IT, but can celebrate the accomplishments of deserving individuals. A time when the cultural barriers have been removed, and it is just as easy and normal for a girl to pursue a career in technology as it is for a boy. I believe that with strong integration of digital technologies in the school curriculum, that time is not far away. As girls and boys learn digital technologies together, with supportive teachers, stereotypes will fade and women and men will work comfortably side by side. Studying IT will simply be another part of everyday life. Because IT already is. About the author: Dr Karin Verspoor works at the intersection of science and technology, applying computation to analysis and interpretation of biological and clinical data, particularly unstructured text data. 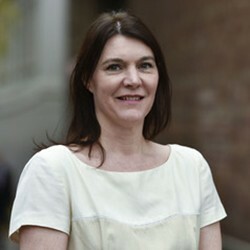 She is an associate professor in the department of computing and information systems at the University of Melbourne, as well as the deputy director of the university’s Health and Biomedical Informatics Centre. She was previously a principal researcher at NICTA’s Victoria Research Lab and served as the scientific director for Health and Life Sciences. Karin headed a research team at NICTA in Biomedical Informatics. Dr Karin Verspoor is an associate professor in the department of computing and information systems at the University of Melbourne, as well as the deputy director of the university's Health and Biomedical Informatics Centre.